I read the first Harry Potter book when it first came out and had no desire to continue on with the series. After watching the fourth movie I started thinking maybe I should give it another shot, but seeing how I've got close to 100 books in my "too read" pile I never did. Then my younger sister and I got into a conversation about the books and she really thought I should read them and then I saw people finishing the final book and saying only "wow" and I figured I really had to find out what the big deal really was. So I bought all 7 books in one go and started reading as soon as I received them. By the fourth book I was totally engrossed and spent most of my time immersed. I finished the final book early this afternoon and I have to say -- wow. I'm no good at analyzing what I read and so I am not sure what grabbed me, but -- wow. I was so surprised to open my e-mail this morning and discover a kind soul and fellow Delawarian had sent me a HAED gift certificate. Thank you! Thank you! I was so touched I almost started to cry -- if I was home I would have! It certainly lifted my spirits after another trying week. Fortunately, the almost-manic state I was in seems to have passed, which is very fortunate since I had my arraignment in Truancy Court on Wednesday. Before going in I asked my God to help me do whatever I needed to in order to make everything okay. And once again she was there for me -- I ended up pleading guilty (which I was certainly not intending to do!) -- basically, she has to go to school but if she does miss a day, I have to send a note in the next day with the reason. If I do that, the case is closed and the record is expunged. I don't even have to pay a fine. Of course, I'm going to have to steel myself when she says she's not feeling well and make her go anyway. I didn't seem to get very much done on First Flight. I'm using a full stitch (1 over 1) on 25 count lambswool Jobelan for this one. I have again strayed from my plans and have decided to work on Tower at Stony Wood before moving on to Heaven Above. 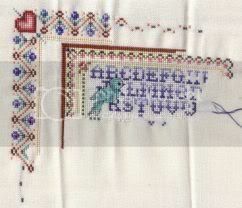 I don't know why I'm so reluctant to work on that, it is really a lovely design. 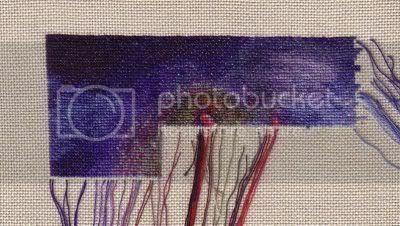 I intend to have a mostly stitching weekend, so hopefully I'll have a good bit to show on Monday! I've been having a horrible time with being on edge lately. 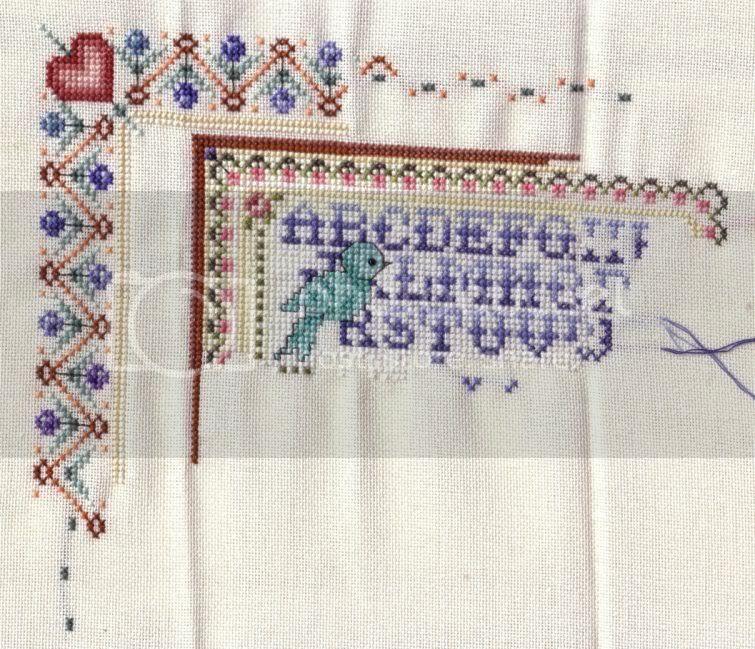 My cross stitch has suffered because I've spent much of my time looking for a replacement cell phone for a phone that works perfectly fine. Which I am also highly annoyed about. I've once again reworked my rotation -- I'm not sure how much of that has to do with my unreasonably amped up psyche. I really think it's the anti-depressant med, I feel like I was doing so much better not taking anything. I'm going to give it at least two weeks and if I'm still feeling like this I'll take it up with my doctor. For slot #1 I worked on Rose Tinted. Which continues to look like a bunch of big red blobs. 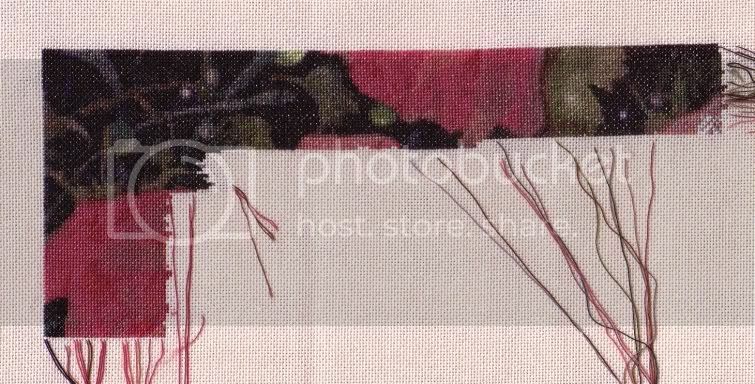 For slot #2 I'm working on First Flight, which is a HAED design with artwork by Lisa Victoria.